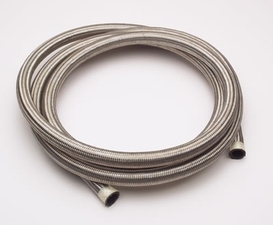 Aeroquip's AQP braided stainless steel racing hose uses a patented elastomer tube to resist oxidation, and a partial inner and full outer stainless steel braid for strength. It is compatible with most fuels, coolants, and oils. With a temperature range of -55 to 300 degrees F, and a maximum pressure rating of up to 1,000 psi, it can handle nearly any plumbing job safely and securely.